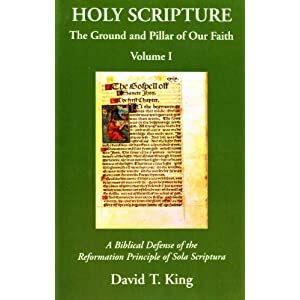 "A collection of five essays and nine book reviews from a respected scholar’s reflection on the doctrine of Scripture. God’s Word has always had enemies, but in recent years the inspiration and authority of Scripture have been attacked with renewed vigor. 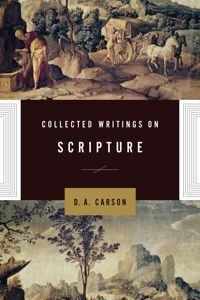 Respected scholar D. A. Carson has written widely on the nature of Scripture over the past thirty years, and here presents a timely collection of his work ..." (From the introduction). Sort of as a tribute to some of the commenters here who may be tempted to think that the Church came before the New Testament, Carson provides an exceptional summary of how the New Testament Canon came into being, and the church's role in that process. 5. Some have given the entirely false impression that the early church took an inordinately long time to recognize the authority of the New Testament documents. In fact it is vital to distinguish the recognition of the authority of these documents from a universal recognition as to the content of a closed list of New Testament documents. The New Testament books were circulating a long time before the latter happened, most of them accepted everywhere as divinely authoritative, and all of them accepted in at least large parts of the church. Most of the New Testament documents are cited as authorities very early indeed; this includes the four Gospels, Acts, the thirteen Pauline letters, 1 Peter, and 1 John. Most of the rest of the contours of the New Testament canon were well in place by the time of Eusebius, in the early fourth century. 6. The criteria by which the early church agreed that certain books were authoritative were basically three. First, the church Fathers looked for apostolicity, i.e., a document had to be written by an apostle or by someone in immediate contact with the apostles. Thus Mark was understood to have the witness of Peter behind him; Luke was connected with Paul. As soon as the Fathers discussed the possibility, they rejected any document under the suspicion of pseudonymity (written by someone other than the claimed author). Second, a basic requirement for canonicity was conformity to the “rule of faith,” i.e., to basic, orthodox Christianity recognized as normative in the churches. Third, and scarcely less important, the document had to have enjoyed widespread and continuous usage by the churches. Incidentally, this criterion requires the passage of time to be useful, and helps to explain why so much time elapsed before the “closing” of the canon (i.e., before the church had almost universally agreed on the status of all twenty-seven New Testament documents). One of the reasons Hebrews was not accepted in the West as early as some letters was that it was anonymous (not pseudonymous! ), and in fact it was more quickly accepted in the East where many (wrongly) thought it to have been written by Paul. 7. Perhaps the most important thing to recognize is that although there was no ecclesiastical machinery or hierarchy, akin to the medieval papacy, to enforce decisions, eventually almost all of the universal church came to recognize the same twenty-seven books. In other words, this was not so much “official” recognition as the people of God in many different places coming to recognize what other believers elsewhere had also found to be true. The point must be constantly emphasized. The church, then, did not confer a certain status on documents that would otherwise have lacked it, as if the church were an institution with authority independent of the Scriptures or in tandem to the Scriptures. Rather, the New Testament documents were Scripture because of what God had revealed; the church, providentially led, came to wide recognition of what God had done in his climactic self-disclosure in his Son and in the documents that bore witness to and gathered up the strands of the Son-revelation. Thanks John for posting about this book by Professor D.A. Carson. It provides a convincing counterpoint to Matthew Bellisario's recent post titled The Church Before the New Testament. I think Carson is awesome. The more I know about him, the more awesome he becomes. Carson is wrong, plain and simple. There were several books of the NT that were not even recognized as Scripture in many parts of the world as late as the year 200. And when the churches did settle upon them, it was not as if everyone was handed out copies to go and evangelize with. Evangelization was done by the oral proclamation of the Gospel from the authority of the apostles passed on to the Church. You guys are really delusional and again prove that history is not your friend. Any time any of you want to formally debate this topic let me know. We'll see how well you fair. I try to read one a day. There were several books of the NT that were not even recognized as Scripture in many parts of the world as late as the year 200. Since Carson basically admits as much, it's not clear how you think this repudiates what he wrote. Did you read Carson's material before commenting on it? So tell us, did the Church of the apostles practice Sola Scriptura? Did the Church immediately following them up until the year 200 practice Sola Scriptura? Yes or no will do. So tell us, did the Church of the apostles practice Sola Scriptura? Did the Church immediately following them up until the year 200 practice Sola Scriptura? Why do you think I'm under an obligation to answer the questions you pose when you don't address the questions others ask of you? As it stands, I did address this very issue in my latest response to you in The Vicious Circle thread (July 22, 2:22 PM). Did you read all of Carson's material before commenting? A simple yes or no will do. This is in accord with the two part Biblical mandate for canonicity – preaching AND acceptance – found in 2 Corinthians 11:4, Galatians 1:9, and 1 Thessalonians 2:13. Catholics need to show the biblical mandate for acceptance of a conciliar (or papal) declaration or at least explain why the Pauline mandate – received directly from Christ – is in error. Its very easy. The answer is no. God reveals himself, then he stops revealing himself, then he writes it down. I'm sure you'll agree that the Apostolic age was a time of revelation; at the same time, it was a time of "writing it down." By the time God stopped revealing, it was all written down. Both David Trobish Paul's Letter Collection (Minneapolis: Fortress Press (c)1994) and Stanley Porter Exploring the Origins of the Bible (Grand Rapids: Baker Academic, (c)2008, eds Craig A. Evans and Emanuel Tov, argue that Paul himself began to collect his own letters. (It has to do with the consistency and uniformity of all the manuscripts). Other writers find allusions in 1 Clement, as early as 96 ad, to each of the Synoptic gospels, as well as Romans, 1 and 2 Cor, Galatians, Ephesians, Philippians, Colossians, 1 Tim, Hebrews 1 Peter, 1 John, and Revelation. So you're not talking about a scarcity of circulation. Donald Hagner believes 1 Clement knew all of Paul's epistles except 1 and 2 Thess and Philemon. (Whether he understood them is another question). You must be aware that the Diatessaron was a translation and compilation of the 4 gospels, as early 165 ad. We're not talking about a paucity of New Testament here, prior to 150 ad. I've done you the favor of citing directly from a Catholic source like Fortescue. As you know, we strive here to be as accurate as possible with our information. Which is something you and many other Catholics don't seem to be interested in doing. That's ok. You have to misrepresent information in service of Mother Church. Mother seems to like misrepresentation, and can't survive any other way. "God reveals himself, then he stops revealing himself, then he writes it down. I'm sure you'll agree that the Apostolic age was a time of revelation; at the same time, it was a time of "writing it down." By the time God stopped revealing, it was all written down. " That is a lie. No where in the early Church do we see a change over from the oral proclamation of the Gospel to only a written one. It wasn't even possible. This foolish claim is refuted by history itself, since the apostles preached the Gospel with no NT, and those who immediately followed them did the same. Do you honestly think that the WCF holds any weight whatsoever? What a joke. Yeah, no one understands Sola Scriptura except you and your buddies John. Thats the beauty of your man made doctrine, just keep changing it so it fits wherever you want to put it per the circumstance of each argument. Then again, objective truth has never had a strong presence among the pretended "Reformers", it is all subjective . The fact is, no one in the early Church believed what you believe. It is all a figment of your imagination. "Carson is wrong, plain and simple." There it is: the infallible Matthew has spoken! The next show's at 9:00pm - thanks for coming. Tell your friends. "God reveals himself, then he stops revealing himself, then he writes it down. I'm sure you'll agree that the Apostolic age was a time of revelation; at the same time, it was a time of "writing it down." By the time God stopped revealing, it was all written down." Why does John Bugay believe this? Is it found anywhere in the scriptures? It is a wicked lie to say that the Church was born into the NT scriptures (say of St. Paul). But, if one cannot say that of the scriptures by St. Paul, who was a convert to the Church, then one should not be putting ones ignorance on public display. The NT scriptures were "born" in the Church and belong to the Church. The Church does not belong to the Scriptures both old and new. BTW, the New Testament, properly speaking, is the Church. The written documents (nt scriptures bear testimony of Christ and his Church - the New Testament). "It is a wicked lie to say that the Church was born into the NT scriptures (say of St. Paul). But, if one cannot say that of the scriptures by St. Paul, who was a convert to the Church, then one should not be putting ones ignorance on public display." You know, I couldn't agree more - you shouldn't be putting your ignorance on public display. Was Paul "converted to the Church" or was he converted to Christ? Whom did Paul encounter on the road to Damascus? The Church or Christ? "In fact, Christ came "in the fullness of time," in the context of, and according to the Scriptures." Then, you would limit scriptures to the Old Testament manuals? Or, would you say that Christ came in the fullness of time in the context of and according to the writings of Paul. Protestants need to learn that the essential element of the science of theology is the ability to make proper distinctions, without which all sense of meaning is lost. "Was Paul "converted to the Church" or was he converted to Christ? Whom did Paul encounter on the road to Damascus? The Church or Christ?" Here comes a wise Protestant!!!. What is Church but "Christ"? This fact could not have been made clearer than in Paul's conversion event. While Saul was persecuting the Church; that's not what he was accused of: "Saul Saul why do you persecute me". In seeking to be wise, some become foolish. "Then, you would limit scriptures to the Old Testament manuals? Or, would you say that Christ came in the fullness of time in the context of and according to the writings of Paul(?)." Neither. This is argument by false choice. I would say that Christ came in the fullness of time according to and fulfilling the Word of God as written by the prophets of God. I would not limit it to the writings of Paul nor the OT. "Protestants need to learn that the essential element of the science of theology is the ability to make proper distinctions, without which all sense of meaning is lost." "What is Church but "Christ"?" Gee, and I thought Church was ecclesia - "called out ones". But your way sure is interesting. So anywhere that I see Jesus in Scripture, I can simply substitute "Church"? So the Church called Lazarus from the tomb? The church was baptized by John? The Church cleared the moneychangers from the Temple? So in Acts 1:10, The Church was taken up into heaven but the apostles were left behind - so the apostles were not part of the church? Does your priest or bishop know you subscribe to these beliefs? No where in the early Church do we see a change over from the oral proclamation of the Gospel to only a written one. Once again, His Eminence confuses “solo Scriptura” with “Sola Scriptura” the distinctive subtleties being lost in bluster and bombast. Yeah, no one understands Sola Scriptura except you and your buddies John. John, I’m sure you’re relieved to know Bellisario is not your buddy – because he surely doesn’t understand. Thats the beauty of your man made doctrine, just keep changing it so it fits wherever you want to put it per the circumstance of each argument. That’s funny, since there is not one, single, documentable aspect of the Church of Rome that has never changed. Ahhh, popes that live in glass houses…. The fact is, no one in the early Church believed what you believe. So, John, you’d be ok if you followed the human teachings of the men of the early Church. But then your beliefs would be subject to their understanding and would not, therefore, be objective – except in Bellsarioland where subjective is objective and ‘always changing’ is ‘never changing’. I’m really surprised that you haven’t yet grasped these Magisterial truths, John. Isn’t looking for doctrine in the ECF’s, by definition, “man made”? Hmmm. the Bible interprets itself. I've head this before. But it leaves me slightly confused. Where in the Bible am I informed as to which of the 66 or 72 are supposed to be in the Bible? Or do we not need an infallible authority (e.g. a church council) to establish an infallible authority (e.g. the Bible)? And why does the Bible not include one or more of the dozen of letters and writings from the early Apostles such as the Gospel According to Peter, The Epistle of Barnabas, or The Didicae? Who determined what was to be in the Bible and what was to be excluded? If the Bible can interpret itself, then surely it can resolve it's own evolution. And if the Bible can interpret itself, then why are their 20,000 + different Christian churches all claiming that the other church is misinterpreting the Bible? Before the Protestant Reformation, the answer was very simple. In fact, the answer now is the same as it was for the first 1500 years. There is an authority that listens and obeys the Holy Spirit as prescribed by Christ. Or, where does the Bible say that the Bible is the only authority on morals and faith apart from men, led infallibly by the Holy Spirit, to interpret it? As a Roman Catholic there is a very easy answer to the authority issue, because it is so explicitly stated in the Bible. And contrary to what many non-Catholics believe, the teachings of the Church are infallible not simply because they come from a man who is the head of an institution, but because they come from the Holy Spirit, as Jesus said they would. Thus, infallibility ONLY comes through the Holy spirit, and yes through men in leadership who have been given that blessing. The non-Catholic proclamation about how no one or no church is infallible, IS in the form of an infallible statement. It is a universal, dogmatic, timeless declaration of fact...to those that say it. And so, logically, if no one is infallible, how then does anyone know absolute truth? Or, how can one even be so infallible to prescribe that no one is infallible? I.M. Fletcher -- wow are you (and Stan Williams) deluded. > Dozie said... "St. Paul, who was a convert to the Church..."
I've always said that the real difference between Romanists and Christians is our understanding of the Church. The Romanist sees the church as the door that admits to Christ, but the Bible believer understands that Christ is the door that admits to the Church. There are 20,000 churches just in the US (I think it's actually closer to 30,000), all with different opinions as to passages in the Bible. Even some people in the same church disagree over what some of the Bible says; some even leave and go and start their own church. So, out of 20,000 churches, all with different opinions, how do you know that yours is the right one and the other 19,999 are wrong? Therein lies the problem: most of these churches are under no-ones authority, or if they are then they do not believe that authority is infallible. Do you believe a man or institution can be infallible? At certain times? Of course you do. The Bible (which I assume you take to be infallible) was written by men, who obviously at the time they were writing, were given the grace through the Holy Spirit to write infallibly. Jesus is the Good Shepherd, yet he says to Peter, "feed my lambs, tend my sheep" - in other words, 'take care of my flock while I am away'. It is so obvious to me. If every person in the US were given a copy of the Constitution and were told "here it is, follow what this book says", and that there need me no authority, no police, no judges to interpret those laws, how do you think we would all get on? There would be disagreements over what it says, and there still are. Jesus never meant His Church to be that way, either. The same reason you know that, out of the supposedly tens of thousands of denominations (a fairly dubious statistic in any case), that the Roman Catholic denomination is the right one and all the others are wrong--you interpret the evidence and come to conclusions. Is that supposed to be so obvious to me, as a Protestant? If the Scriptures can be so obviously interpreted on their own, why do we need the Magisterium to interpret it for us? The evidence is right before my eyes (and yours). Does any other church claim to be able to make infallible statements regarding Faith and Morals? No, because they know (even subconsciously) they do not have that authority. The Catholic Church does because Jesus bestowed that authority. Does any other church claim to have priests who can (because Jesus has given his authority) forgive sins in the confessional? They would not dare because, again, they know they do not have that authority. But the Catholic Church does because Jesus gave His authority to do so ("whose sins you forgive, they are forgiven, whose sins you retain, they are retained"). If I were an early Christian, somehow magically transported to today I would look around for the Church that still claims to have this Authority to make infallible statements on Faith and Morals (there is only one), and to forgive sins through Jesus Authority (again, there is only one church who claim this). You obviously believe that Jesus gave this authority to the first church because it is there in the Bible. So, when did the church lose this authority (as far as you believe). The 1st century? the 2nd century? The Reformation? I contend that the Church still has (and always will have) this Divine Authority, because Jesus said to Peter that upon him he would, "build my Church, and the gates of Hell will not prevail against it"
I. M Fletcher: Does any other church claim to be able to make infallible statements regarding Faith and Morals? Lots of people make lots of claims. The Roman Church is long on bombast but short on evidence in this regard. The Catholic Church does because Jesus bestowed that authority. The Catholic Church usurped what *may* have been a personal promise to Peter and claimed it for itself. Some might call that "theft." Does any other church claim to have priests who can (because Jesus has given his authority) forgive sins in the confessional? How much do you know about the beginning of "priests who forgive sin in a confessional"? But the Catholic Church does because Jesus gave His authority to do so ("whose sins you forgive, they are forgiven, whose sins you retain, they are retained"). Commentators rather attribute to this "the authority to grant or deny access to God's kingdom." The key to this is the proclamation of the Gospel, not "priests who forgive sin in a confessional," which didn't occur until 1000 years later or more. when did the church lose this authority (as far as you believe). A better question would be, what kind of "church" was Jesus talking about? What did he really give it? You should read something other than Catholic propaganda. There really is a lot of information available. The evidence is right before my eyes (and yours). If I am able to interpret the evidence for myself, why did you ask how a Protestant would discern what was true with tens of thousands of theological competitors, implying that such knowledge was impossible to obtain on my own? You seem to be changing your argument or not following the discussion. Does any other church claim to be able to make infallible statements regarding Faith and Morals? Apparently you've never heard of larger denominations like the Eastern Orthodox. Of course, the amount of verses your denomination has infallibly interpreted is less than a handful, so I don't see why you're promoting this aspect of your denomination as a solution to the difficult task of resolving which denomination is true due to the varying interpretations of the Bible. No, because they know (even subconsciously) they do not have that authority. Aside from the confusing division between knowledge and subconsciously held knowledge, I'm amazed at the breadth of your insight. How did you manage to discern the internal, subconscious beliefs of tens of thousands of churches and all of their members? Unfortunately, this is just a naked assertion. Am I supposed to take you on your word? You obviously believe that Jesus gave this authority to the first church because it is there in the Bible. If I thought the Apostolic church and its members held to distinctively Catholic beliefs and practices, I would be a Catholic. How does that follow? It's not obvious how you'd make an exegetical argument for your conclusion based on the text of Matthew 16:18. You certainly haven't made a prima facie case. For all you've written about evidence, you have yet to produce anything beyond gratuitous assertions. Does your middle initial stand for Matthew by any chance? If so, then maybe both you and Matthew Bellisario have something in common with Matthew Schultz. But suffice it to say that Matthew Schultz interprets and applies Matthew 16:18 correctly. Thank you and that will be all. Is this supposed to imply an authoritative or final word on/resolution of, the issue? If it is, why do you mock the Catholic Church? If it is not, why do you waste your time and everyone els's? You see, whatever you've written could be as good as blowing hot air - as good as nothing was said. Is this supposed to imply an authoritative or final word on/resolution of, the issue? If it is, why do you mock the Catholic Church? If it is not, why do you waste your time and everyone els's? It is neither authoritative nor final; but it does express an opinion, and will give him some idea of what we think. I don't feel compelled to lay out my case for every newbie in every comment box. If we are wasting your time, then why do you come here?